Throughout the menopausal transition, women may experience a combination of the 34 menopause symptoms, nausea being one of them. Nausea can simmer for hours, making life generally unpleasant and perhaps even forcing you to curl up around the toilet. Continue reading to learn about what causes nausea during menopause, other menopause symptoms, and what you can do to help alleviate them. 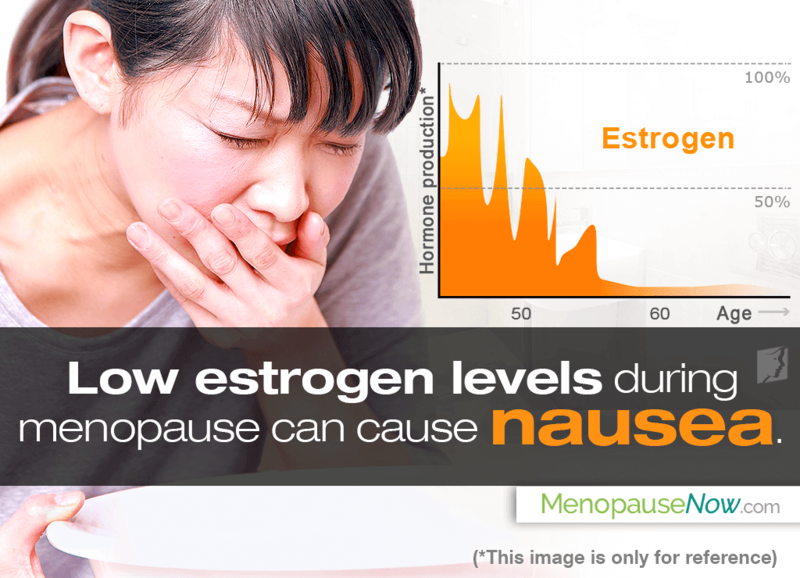 What Causes Nausea during Menopause? While there isn't much research on the connection between nausea and menopause, nausea is believed to be caused by fluctuating hormone levels, which is similar to the over 30 other menopausal symptoms. These hormonal imbalance symptoms often begin during perimenopause, the first stage of menopause transition, which generally begins in a woman's 40s or early 50s, although it may begin slightly earlier or later. What Other Symptoms of Menopause Can Accompany Nausea? Fatigue. Up to 80% of women will experience fatigue at some point during menopause. Nausea can actually result from exhaustion. Dizziness. Vertigo can create feelings of lightheadedness, imbalance, and disorientation, all of which can lead to nausea. Bloating. Caused by fluid retention and intestinal gas due to hormone imbalance, bloating can cause pain and nausea. Hot flashes and night sweats. As two of the most common menopause symptoms, both can leave a woman feeling temporarily dizzy and nauseated. Stay hydrated. Focus on water and occasionally complement with beverages like sports drinks, which can replace electrolytes lost if you vomit. Eat bland foods. Bread, rice, overcooked carrots, light broth, or crackers are bland enough as to not contribute to further stomach upset. Sit up after you eat. Simply put, don't lie down. Healthy diet. Maintaining a healthy diet rich in phytoestrogens - plant-based estrogens that act as the natural estrogen in the body - as well as complex carbs, healthy fats, and lean proteins, found in avocados, grass-fed meats, sweet potatoes, olive oil, and more. Regular exercise. This will encourage endocrine system health, release feel-good endorphins frequently, and preserve muscle mass. Aim for at least 30 minutes of moderate exercise per day, five days a week. Stress reduction techniques. Deep breathing exercises, yoga, tai chi, mediation, or any other relaxation method can help keep your mind calm and centered. While tips for managing symptoms may help, find long-lasting relief from the 34 menopause symptoms and nausea by treating the principal cause of hormonal imbalance. Click on the following link for menopause symptom treatments that do just that. There are several health-conscious approaches to relieving common menopause symptoms. Treatments include herbal supplements and lifestyle changes.